It's September 2, 2008 and the Republican National Convention is taking place in Minneapolis. Across the river at the Target Center, an audience of several thousand have gathered for the Rally for the Republic, a parallel Ron Paul convention. The speakers for the event have been announced in advance with the exception of one surprise special guest. Emcee Tucker Carlson declines to announce him, but the crowd cheers as the speaker approaches the podium. It's John McManus, president of the John Birch Society. The 2008 event received limited coverage at the time, but Paul's long term relationship with the JBS warrants more scrutiny as Paul continues to launch new components of his "Ron Paul Revolution." This is the second article in a series, with more to come. For the first installment, see "Ron Paul to Keynote Catholic Traditionalist Summit with Neofascist, and Overtly Anti-Semitic Speakers." McManus is also speaking at the summit sponsored by the Fatima Center. As Mcmanus finished his short speech at the rally in 2008, he closed with the words, "If you like Ron Paul, you'll love the John Birch Society." See the embedded video below. Skip to about 7:09 to hear the last couple of sentences in McManus' speech. Other speakers at the rally included some of Ron Paul's long time allies - Lew Rockwell, Thomas Woods, and Howard Phillips. Also speaking were Barry Goldwater, Jr., Bob Barr, Grover Norquist, Bruce Fein, Doug Wead, and Jesse Ventura. Howard Phillips, founder of the Constitution Party who passed away in April, described the Civil War as the "war of Northern aggression" during his speech at the rally, as noted by ABC News. A short promotional overview of the event can be viewed here. In the last week of September 2008, Ron Paul refused to endorse the GOP presidential candidate John McCain, and rejected the offer of being Bob Barr's vice presidential running mate on the Libertarian ticket. Instead, Paul endorsed Chuck Baldwin of the theocratic Constitution Party. The Rally for the Republic was the first event of Campaign for Liberty, a nonprofit established to continue the activism of the "Ron Paul Revolution." Other recent entities have been formed to advance the revolution including the Ron Paul Curriculum for homeschooling, the Ron Paul Institute for Peace and Prosperity, and the new Ron Paul Channel offering a subscription to three 30-minute shows for week. The JBS has again become a force on the political Right through it's extensive involvement in the Tea Party movement. In recent interviews Ron Paul has taken credit for initiating the movement, although a Koch-funded entity had created a model and U.S. Tea Party webpage as early as 2002. This archived link is to a U.S. 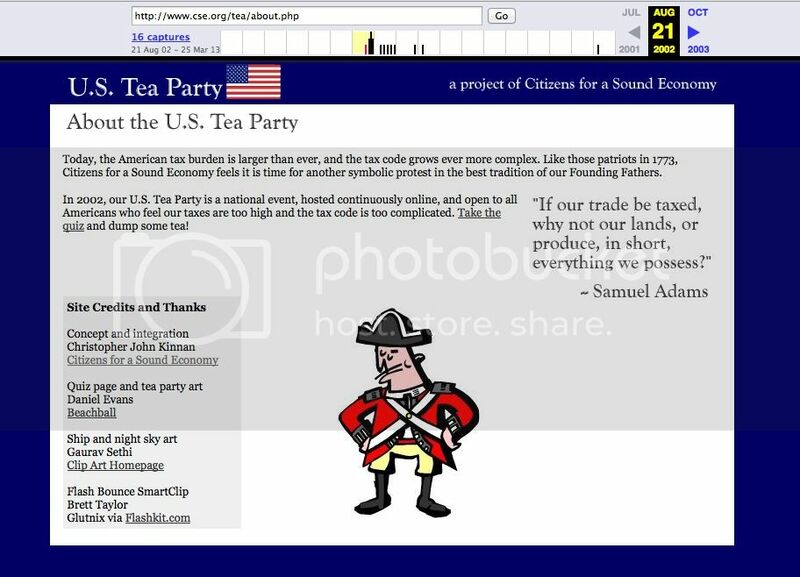 Tea Party webpage from August 2002 was posted as a project of Citizens for a Sound Economy. Founded in 1984 by David and Charles Koch, Citizens for a Sound Economy divided into two entities in 2004 - Americans for Prosperity and FreedomWorks. The JBS was founded in 1958 by Robert Welch. Fred Koch, father of the infamous Koch brothers, was one of the founding board members and on the JBS National Council. Ron Paul is a regular headliner at JBS events around the country, including the 50th anniversary celebration in 2008. According to Jason Rink, author of Ron Paul: Father of the Tea Party, Paul pulled some of his legislative staff from the JBS staff during the years that it was still headquartered in Belmont, Massachusetts, including Lew Rockwell and the late John W. Robbins, both former chiefs of staff for Paul. “Ron Paul may not be a member of the John Birch Society, but you need a micrometer to tell them apart,” stated Chip Berlet to Huffington Post. In Right Wing Populism in America, authors Berlet and Matthew Lyons explain that since the 1990s the JBS has returned to promotion of the Illuminati Freemasonry conspiracy theories of founder Robert Welch, in which "there is an unbroken ideologically-driven conspiracy linking the Illuminati, the French Revolution, the rise of Marxism and Communism, the Council on Foreign Relations, and the United Nations." The late Larry McDonald, a U.S. Congressman and second president of the JBS, described the organization as Old Right as opposed to New Right. A 2010 New Yorker article describes the exile of the JBS to the fringes of conservatism because of it's paranoid conspiracy theories. The leading intellectual spokesman and organizer of the anti-Bircher conservatives was William F. Buckley, Jr., the editor of National Review. Buckley was by no means moderate in his conservatism. He was a lifelong defender of Joseph McCarthy and a foe of New Deal liberalism. But he drew the line at claiming that the course of American government was set by a socialist conspiracy, and he feared that the ravings of the extreme right would cost more balanced, practical conservatives their chance at national power. "By 1961," his biographer John B. Judis writes, "Buckley was beginning to worry that with the John Birch Society growing so rapidly, the right-wing upsurge in the country would take an ugly, even Fascist turn rather than leading toward the kind of conservatism National Review had promoted." "I always say to my liberal friends you better stop laughing at these people and pay attention. The ideas that you hear today coming from the right were generated in the '60s by the John Birch Society." Also see Chip Berlet's overview of the John Birch Society and two of my previous Talk2action.org articles on Ron Paul here and here. Check back later this week for another post in this installment on the John Birch Society and other Ron Paul Revolution allies. William Buckley had good reason to be worried. As author Arthur Goldwag has warned "It's [JBS] past may well become our future." Leonard Zeskind in his book Blood and Politics (page 435) reported that Ron Paul "maintained a leadership position in the John Birch Society, and then re-entered the Republican Party." Thus, Berlet's micrometer has shrunk to zero. Second, researcher Mark Ames has a screen capture of a newspaper article from 1985 identifying Ron Paul as the first chairman of the Koch-funded Citizens for a Sound Economy. Ames's article can be found at http://exiledonline.com/radicals-for-corporate-pollution-the-koch -cartel-the-heartland-institute/. The Ames report is fully collaborated by a document at the University of Kansas library which has a fundraising letter for the organization signed by Congressman Ron Paul. The letter is at http://www.lib.ku.edu/paul/RonPaulCitizensforaSoundEconomy.pdf. I do not know how long Ron Paul was affiliated with Citizens for a Sound Economy, but one cannot dismiss the idea that he has remained linked to the Kochs and has some link to that idea of a Tea Party. In fact, my own research suggests that the Tea Party that emerged in 2009 was brought to fruition by two tracks--one Koch, one Paul. Koch laid down the Internet infrastructure of interlinked libertarian websites through the Sam Adams Alliance, while Ron Paul transformed his presidential campaign into the Campaign for Liberty which became one leg of the Tea Party movement. Ron Paul's CFL then networked with the We The People Foundation headed by Robert Schultz, the Constitution Party headed by Howard Phillips, and the Libertarian Party linked to Michael Badnarik to put together the "Jekyll Island Project" which led to the self-declared 'continental congress.' The latter, according to the SPLC, led to the re-emergence of the Patriot movement and its armed wing the militia. In fact, the 'continental congress' is at the center of several developments. I'm repeating the url for the letter archived at the University of Kansas library! Cupshe Coupons Thanks for sharing the informative information through the article. and all the details are awesome and good in this post.